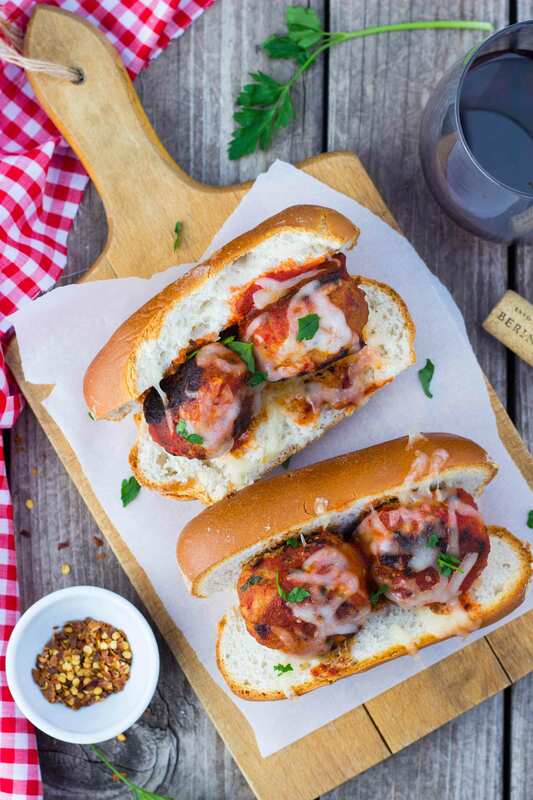 Meatball subs make a great weekend meal, and no one will guess they’re a blend of spaghetti squash and lean ground turkey. Cut the spaghetti squash in half, lengthwise, and scoop out all the seeds. Using a metal spoon, scrape the inside of the spaghetti squash so that it comes out in small pieces. You should get about 2 cups of spaghetti squash. Heat a large pan over medium heat and add 1 teaspoon olive oil. Then add spaghetti squash, ¼ teaspoon salt, ½ teaspoon dried oregano, and 1 pinch of red pepper flakes. Cook squash until tender and cooked through, 10 minutes. Let cool. In a large bowl, mix the spaghetti squash, ground turkey, egg, breadcrumbs, garlic, Parmesan cheese, parsley, ketchup, thyme, pepper, ½ teaspoon salt, and ¼ teaspoon dried oregano. Use your hands to evenly mix all ingredients together. Heat a large pan over medium heat and add 1 teaspoon olive oil. Form the turkey mixture into 12 evenly sized meatballs. Heat meatballs until cooked through, 20-30 minutes. Once meatballs are cooked, pour marinara sauce over them and cook until heated through, 3 minutes. Preheat the oven to 400° F. Place 2-3 meatballs in each bun and spoon desired amount of marinara over each. Top with 1-2 tablespoons shredded mozzarella and place in the oven until cheese is melted, 5 minutes. Nutrition analysis: 590 cal, 26 g fat, 105 mg chol, 920 mg sodium, 60 g carbs, 6 g fiber, 13 g sugar, 29 g protein.